You may see one silhouetted as a solitary figure on the horizon or 40,000 migrating across the river in front of you. In either case you will be entranced. Caribou on the Coppermine River. On many of our northern river expeditions we have the opportunity to view caribou. These well adapted creatures have roamed the tundra and provided sustenance to the inhabitants for thousands of years. They may be found from the tundra of the high arctic to the southern limit of the boreal forest, as far west as the Coast Mountains and rain forests and east to the craggy shores of the Atlantic Ocean. 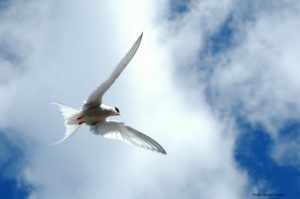 Many significant archaeological sites have been found intercepting migratory patterns of these animals indicating a long standing relationship with man. Caribou are members of the deer family. We often speak of them as either Barren-Ground or Woodland. The Barren-Ground inhabit land from Hudson Bay to the Mackenzie river. Within this species there are five main herds and some smaller ones. Each is named for the region in which they calve. 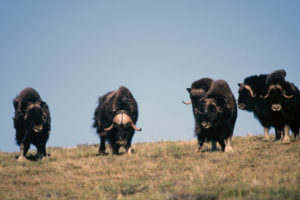 The Bathurst heard is named for Bathurst Inlet and is the most accessible herd to people because the southern edge of their range encompasses the city of Yellowknife. The Bluenose herd is named after Bluenose Lake, the Beverly for Beverly Lake in the Thelon Game Sanctuary, the Porcupine for the River of the same name in the northern Yukon and Alaska and the Kaminuriak herd is named after Kaminuriak Lake just west of Hudson Bay. Three subspecies are: Grant’s, Woodland and Peary Caribou. 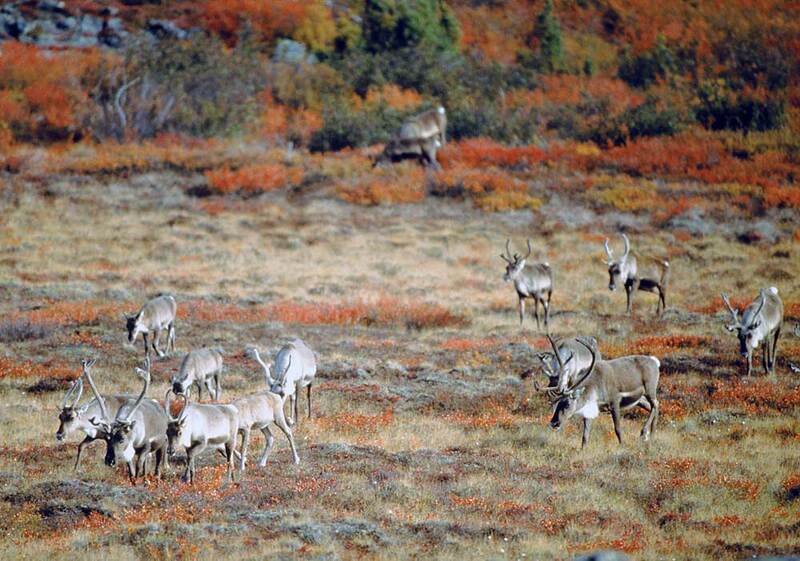 The Porcupine herd of northern Yukon and northeastern Alaska are Grant’s Caribou. Woodland Caribou occur throughout Canada except in New Brunswick, Nova Scotia, and Prince Edward Island. They favour boreal forests and mountainous regions. Peary Caribou are confined entirely to Canada’s arctic islands. An often asked question regards the relationship between Caribou and Reindeer. The fabled “sleigh pulling” animals belong to the same species as caribou, however they have shorter legs and a wider back. In northern Europe and Asia they have been domesticated for centuries. In the late 1890s they were brought over to North America and the reindeer currently inhabiting the Northwest Territories are decedents of this herd. The visual similarity is so great that a court case declared it was unreasonable to expect a hunter to be able to distinguish reindeer from caribou. As year ’round foragers the caribou must rely upon their sense of smell in winter to detect food through deep snow. Employing broad hooves they dig to uncover the hidden treasures. Lichen forms the winter dietary staple. In the summer this is replaced by new, more appetizing plant growth. Fungi is added to the diet in the fall. Caribou display excellent food resource management. They eat while walking and as a result the damage sustained by the fragile plants is reduced. This prevents over harvesting of one area, while spreading out food consumption. Recovery time of the plant communities is also reduced. Traditional hunters use every part of the animal. The hide is prized for warm clothing due to superior insulative properties. The hair is structured in a network of honeycomb shaped cells that are able to trap pockets of air. The individual hairs are densely packed together enhancing the effect. Ice and snow that build up on the fur can be beaten off easily with wooden or bone “beaters”. Every piece of flesh is edible and even the fermented stomach contents are consumed. Considered a delicacy, the contents are rich in plant nutrients required to stay healthy in an environment where plant life is not always available. Bones are employed for scrapers, awls, knives and other implements. The clicking sound made as a heard travels is thought to be caused by the articulation of the “ankle” joints. It is a happy coincidence that caribou are curious. As a result there is little sport in hunting them. They are commonly known to approach a hunter out of curiosity and show little fear of man. They have been referred to as “cattle of the barrens”. Even today caribou are, in essence, the “life blood” of many native people. James Pokiak, who guides our Horton River expedition, requires 15 caribou per year to feed his family. Both the meat and the hides are essential to traditional lifestyle and survival in the arctic. 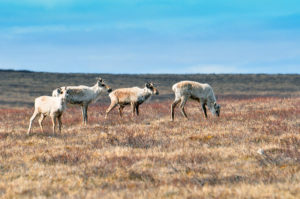 Biologists estimate that the NWT has 1,310,000 caribou. This is one for every 2.6 square kilometres or 21 times the population of people. Advice to those of you travelling on a northern river this summer – keep your eyes peeled for caribou! This article was originally published in our fall 1994 issue of our Northern Currents newsletter.